If you watch the NFL and play Madden every year as the season progresses, you might use the game as a barometer for real-life player performance. There are over 1,600 athletes playing in the NFL during the regular season, but due to increased roster limits during the offseason - when coaches are testing players to compile their final roster - there could be over 1,100 more players to account for on the field and in the game. Someone has to create and manage the skill ratings for these players in the series every year, and that someone is EA Tiburon's Donny Moore, known at the developer as the Madden team's "Ratings Czar." Moore knows firsthand that some athletes are simply better than others, and they prove it as the NFL season progresses. Take Victor Cruz, for example. He started Madden NFL 12 with an overall player rating in the 60's out of a possible 99, among the worst players in the game. Like other NFL player hopefuls, the New York Giants receiver was an afterthought, since he wasn't selected among the 255 athletes chosen in the seven-round NFL Draft. The odds of an undrafted free agent, and even the occasional players drafted in a lower round in some cases, making a team's final 53-man roster is fairly low, and the perceived talent level of those players, compared to their drafted peers, are even lower. Cruz made the cut, and eventually wowed fans and fantasy football owners throughout the 2011 season. In his debut season's third week, Cruz caught three passes for 110 yards and two touchdowns against the Philadelphia Eagles. In that week's Madden 12 roster update, his overall rating - the out-of-99 score given to players based on performance - jumped from 64 to 72. By season's end the Giants were Super Bowl champions and Cruz's overall Madden 12 rating leapt to 88, thanks to an astonishing 1,536 yard, nine-touchdown season. As Cruz impressed fans, Moore increased his Madden rating, which meant his virtual counterpart's abilities improved as well. Moore worked on player ratings since around Madden 2002, when player ratings like elusiveness and trucking, which dictate how well runners avoid being tackled, didn't exist. Moore says that with an efficient system, it took anywhere between 15 and 20 minutes to give a player their ratings in the game back then, whereas now it takes around 35 minutes. Player ratings "can't just be coming out of thin air," Moore tells Joystiq. So he starts out by looking at scouting reports for college players entering the NFL Draft using resources such as ESPN Insider, Sporting News, CNN SI and NFL Draft Scout as the NFL season winds down and the Super Bowl ends. "I have, like, 15 windows open when I'm creating a player," Moore says, referring to the same resources both teams and fans have access to. Using these sources, Moore jots down athletic benchmarks, such as 40-yard dash times and vertical jump records collected during the NFL's scouting and records-recording process at events like the NFL Combine and individual schools' pro days. Each number slots in to formulas and tools the developers use that match up with Madden player ratings, such as speed ratings deriving from these official 40-yard dash records, but the text of a professional scouting report can influence a player's rating as well. In the case of Green Bay Packers rookie running back Eddie Lacy, he is known for his spin move, even being called "circle button" by his friends. "I read that over and over in scouting reports," Moore says. "So I wanted to make sure that in Madden that was a big-time strength for him in comparison to things like agility or elusiveness." The reputation of a player through his college career may play a bigger hand in some ratings more than others, playing into how accurately each quarterback can throw the ball in the game. "I start reading the reports from all these various outlets and sources talking about [Jets QB] Geno Smith, and talking about what his strengths are and what his weaknesses are," Moore says. "And I start coming up with themes and start ranking guys in terms of, 'okay the strongest arms in the draft class need to be one of these two or three guys, because that's the theme that comes out the most, and the weakest arms are these three guys,' and everything else sort of slots in between." 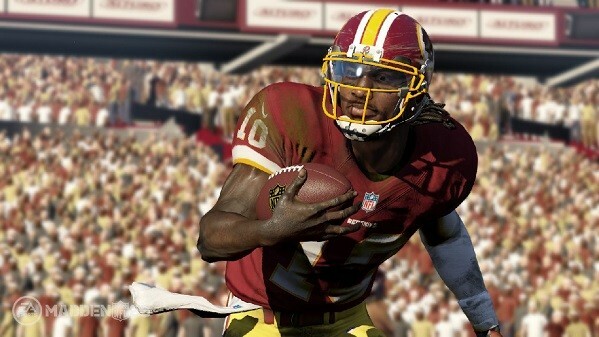 By the time the NFL Draft arrives in late April, Moore will have created the virtual versions of the top 200 to 300 athletes along with their ratings for the upcoming version of Madden, but the draft only kicks off the unending tweaks and adjustments made to the players, even based solely on where athletes were picked in the draft order. "If a guy sort of comes out of nowhere, they had him pegged to go in the seventh [round] or be undrafted and he goes in the second round, well he can no longer be rated like a 61 or whatever his undrafted grade was," Moore says. "So we'll grade him more around a second round grade and maybe bump up a few of his attributes where he's strongest." Likewise, players such as running back Marcus Lattimore, who was Moore's second-highest rated rusher heading into this year's NFL draft thanks to his 1197-yard, 17 touchdown season in 2010 at the University of South Carolina prior to suffering multiple knee injuries in 2011 and 2012, dropped to the San Francisco 49ers in the fourth round of the draft after other teams opted to not select him. Accordingly, Lattimore saw a small decline in his initial Madden 25 ratings. Then come the weekly roster updates. Moore's workweek begins on Sundays, when he sits down to watch football through the NFL RedZone channel with a notepad in hand. "I'm just making my own personal notes about what players are a) making big plays, b) putting up big numbers or c) looking really bad, getting kind of stuck on a big play or missing a tackle, or missed a field goal, interception or whatever it might be negative-wise," he says. "If a guy like [Eagles QB] Michael Vick has two fumbles in a game, you bet he's going to lose five or six points off his carry rating." Moore points to fellow Eagles player Bryce Brown as an example of how heavily-impacted a players' ratings can be based on their performance on a week-to-week basis. Brown had consecutive two-touchdown games against the Carolina Panthers and Dallas Cowboys last season where he averaged over seven yards per carry attempt, but also fumbled the ball three times in those two games. "It was weird because I was increasing a lot of his ratings... but then I was lowering his carry rating because throughout his ascension, he was showing he had really, really poor ball-handling skills," Moore notes. "So I think his carry rating dipped below 70." The bulk of these stat adjustments happen on Mondays, when "a lot of injury report" and "depth chart adjustment stuff," like team roster changes for injured players are accounted for leading into the Monday Night Football game. "On Tuesdays, I get stuff from Pro Football Focus, Football Outsiders and a few other websites that I use for football metrics that grade players on a per-play, per-game basis," Moore says. "That [data] goes into some ratings adjustments. Wednesday morning I have to get it to our QA department to test. I'll write up a blog, and then it's basically out Friday morning." Moore will often have some fun with the weekly roster updates, increasing Cincinnati Bengals wide receiver Chad Ochocinco's (now Chad Johnson) kick power and kick accuracy ratings after he booted the ball through the uprights in one preseason game while Kicker Shayne Graham was out with an injury. Moore also took heed when now-former Jets safety Kerry Rhodes posted a video to his YouTube account in July 2009, demanding that his throwing ratings be increased because he was a quarterback in college. "He was really mad that his throw power was lower than Nick Mangold, who is the center," Moore says. Rhodes' throw power in the game was a 21 versus Mangold's 22 rating. "These are ratings where you just move on, because they're non-positional. But they did a whole trial where Kerry Rhodes out-throws [Mangold], and after that I bumped up Kerry Rhodes' throw power," he laughs. With Madden 25 in stores, video game players can browse through the game's rosters to see the bulk of Moore's work since February, and rank players themselves on NFL.com to influence Moore's weekly roster updates. You never know, one of those 64-rated receivers you're passing over could be the next Victor Cruz.